I often tell just about anyone who will listen that I love to “wallow in the holidays”. There’s no better way to describe my deep love of the cooking, entertaining, gifting, and connecting that comes with the holiday season. I make elaborate plans that I often manage with multi-tab spreadsheets and I spend hours upon hours in my kitchen dishing up everything from sweet treats to hearty holiday dishes. And despite my extended planning and virtual camping out in my kitchen, I’m routinely challenged by one meal. For whatever reason I just can’t get my family breakfast act together. I’m just fine when I’m on my own for breakfast. A quick bowl of oatmeal or a quick reheat of a favorite muffin is enough to send me on my way. But when the whole family is at play, I’m simply at a loss. And of course, during the holidays, breakfast for the family is on my to-do list more than at any other time of the year. It may be that I’m just not constitutionally capable of putting together a whole meal before my caffeine has had a chance to work, but I loathe the idea of making a whole meal before 9 or 10 am in the morning. The silver lining in this whole situation is that I’ve spent the last several years looking for easy breakfast recipes that don’t just feed a crowd, but satisfy the deep-seeded need my family seems to have for a hearty breakfast on a winter morning. French toast casserole is always well received and of course it’s hard to go wrong with a breakfast taco bar. Also among my collection of holiday breakfast survival recipes is a German pancake that is a great alternative to flipping flapjacks for a group. It cooks quickly and easily in a cast iron skillet in the oven and I can make the batter the night before. 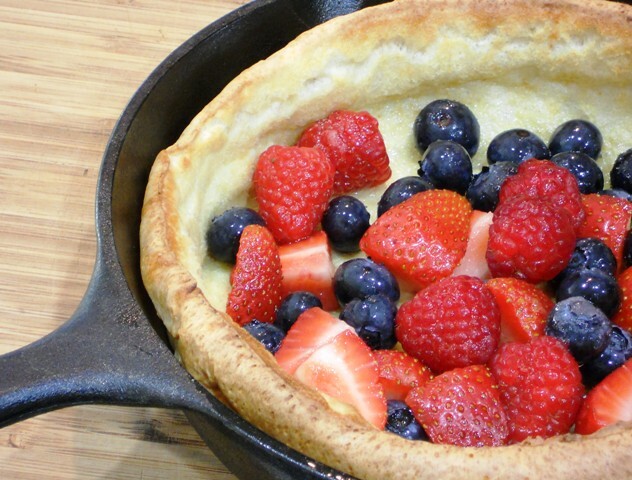 I like to top my German pancake with fresh berries, but it’s a lovely vessel for a wide variety of toppings. Paired with favorite breakfast meats and some juice, this dish makes for a simple and tasty holiday breakfast that people think I’ve slaved over but that in reality doesn’t take more than 30 minutes to get to the table from the time I shuffle into the kitchen in my jammies. Preheat the oven to 425 degrees. Put the butter into a 9 inch cast iron skillet and place the skillet in the oven so the butter can melt while the oven preheats. Whisk the milk and eggs together in a medium size bowl. Add the next five ingredients (flour through orange zest) to the bowl and whisk to combine. Remove the pan from the oven and tilt it around to evenly distribute the butter. Pour the batter into the skillet and return the skillet to the oven. Cook the pancake for 12 -15 minutes or until very puffy and nicely browned. Remove the skillet from the oven and add the berries to the pancake. Serve directly from the skillet for a fun presentation. While a cast iron skillet helps with a crispy bottom and a lovely presentation, any oven-proof skillet or baking dish will do for this recipe. You can make the batter the night before you plan to make the pancake and refrigerate it. Remove the batter from the fridge when you start to heat the skillet in the oven so it can warm up a bit. It may separate but a quick whisk will bring it back together quickly. The options for filling your pancake are endless. A simple dusting of powdered sugar may suffice as might a thin layer of your favorite local preserves. Diced apples cooked with a bit of sugar and cinnamon until tender are a perfect fall filling, and stone fruit like plums and peaches make for a hearty topping. Consider the pancake a blank slate just waiting for you to finish it with your personal creation. This recipe doubles or triples easily. If you have more than one cast iron skillet you can cook two pancakes side-by-side in the oven at the same time. If you only have one skillet, remove the cooked pancake from the skillet and place it on a serving dish. Make the next pancake in the same way you made the first while you fill and devour the first. If you happen to have several smaller oven-proof pans at home, you can make individual pancakes. I have two 5 inch cast iron skillets that are the perfect vessels for personal pancakes. I simply divide the pancake among the two pans and cook it for just a few minutes less.